Bob uses a wide variety of tools to make and repair wheels in the shop on his farm. 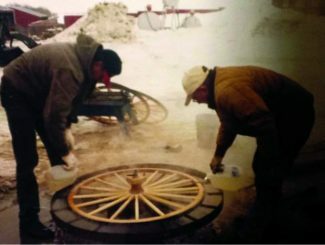 Bob Svangtsu (right) and his wheelwright friend Dale Sparks cool the iron rim they just heated to set on a newly made wheel. Bone-chilling North Dakota winters in Crosby don't rank toward the top of Bob Svangstu's list of favorite things, but they do draw him to his shop to spend time at what's become a favorite task: making wooden wheels. 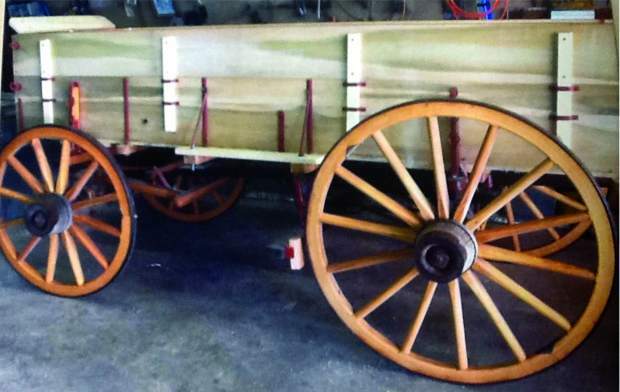 The wheelwright craft is the oldest known to man, dating back to prehistoric times. 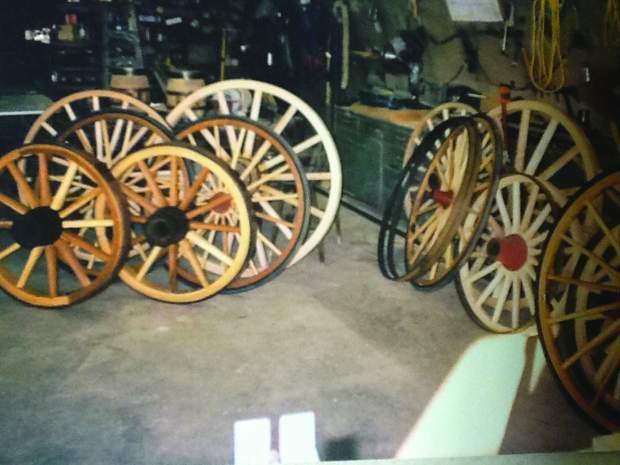 Spoked wooden wheels originated in the early 17th century. The art of creating "dished wheels," which are shaped like a saucer with the hollow side facing outward, is the only significant change in wooden wheel design since those early days. The dished design included spokes driven into the hub at an angle so the lowest spoke stood perpendicularly to the load and the upper part of the wheel sloped away from the vehicle. Dishing enabled the body of the vehicle to be wider at the top than at the floor, helping the wheel withstand the lateral thrust of the axle caused by the action of the animals pulling it. Svangstu's love for the wheelwright business began with his childhood exposure to horse-drawn vehicles. "I've always had an interest in driving horses," Svangstu said. "When I was young, my brother and I gathered up old buggies and wagons but we never did much with them. I had a friend who went to a wheelwright school in Montana to learn the trade. Twelve years ago I decided to take the training, too." Carving out a wheel starts with creation of what's known as a nave or hub, which goes at the center of the wheel and connects the wheel to a horse-drawn vehicle. Hubs are typically made from well-aged oak or elm. Elm has strong cross-grained fibers which help keep the hub from splitting under strain. Svangstu makes smaller hubs and could order larger ones from Amish wheel makers if necessary. He also orders Amish spokes and felloes, which are almost entirely shaped from hickory. "Hickory has more spring in it than oak," Svangstu says. "When you're driving a vehicle like a buggy, if you hit a rock on the road you want that spoke to give a little bit. Sometimes oak is used for felloes, but not often." A myriad of tools is used to create wheels. Mortise bits are used to create square holes in the hub where the spokes fit. In early years, spokes were shaped with an axe, saw and spoke shave so they would provide the maximum amount of strength with a minimum amount of weight. Now a milling machine is used to make both the dowel round ends called tenons and the square ends that fit into the hub. Fellies are the rounded pieces of wood that form the outside of the wheel. Different types of wood are used to make fellies, including ash, elm, oak and hickory. The pieces can be cut out of a sheet of wood with a bandsaw or cut in straight pieces and soaked and shaped in a form. The fellies Svangtsu uses are steam bent. Holes are bored into the fellies so spokes can be fastened to them. "It takes four or five days to make four wheels," Svangstu says. "I use a drill press and make most of the other pieces of equipment I need for the job. The main hand tool I use in making wheels is a traveler. It measures the circumference of the wheel. You can't use a straight ruler to measure wheels. It has to be a tool that rolls around the outside of the wheel." Tenon cutters help create the exact shape necessary to fitting spokes to fellies. Once spokes are fitted into the hub and into fellies, there's one final step to set the tires. "The iron rim that goes around the outside of the wheel has to be just slightly smaller than the wheel so it fits tightly on the wheel when the iron tire cools," Svangstu said. "The rim has to be heated to just the right temperature to be fitted. If you heat it too much, it will warp the rim and it won't fit right. If it's not heated enough, it won't be tight on the wheel." In years gone by, cobs were often used in the fire that heated rims because they quickly come to a high temperature when they burn. Svangstu, who doesn't have corn crops in his neighborhood, uses lumber to make a fire. "For the most part we use scrap wood to build a fire on the ground," Svangstu says. "You lay the rim down in the fire and check it every so often to gauge whether or not it's hot enough. You don't want it to be red hot. That's too much. Old timers used to say if an oak stick rubbed against it felt like it was greased, then the rim was hot enough. If the stick dragged still, the rim should be hotter." Once the rim reaches the desired heat, tongs are used to remove it from the fire and wrestle it onto the tire. "We fasten the wheel down and sometimes you have to give the rim a tap to get it on the wheel," Svangstu says. "The rim will be hot enough that the wooden fellie smokes as the rim cools down and tightens onto the wheel." Many of Svangstu's customers use their horses and buggies or carts for show in pleasure classes. If someone wants rubber on the wheels, he first puts roll channel iron onto the wheel backwards so the rubber fits into the channel iron. He partnered with a friend on a machine used for that. Svangstu's wheelwright business doesn't have him going in circles by any means. 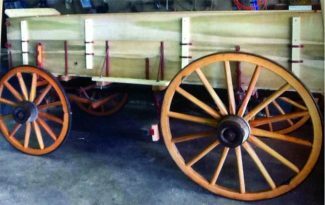 Many customers come from the area surrounding his northwestern North Dakota home, but he's also completed work on wooden wheels for customers in South Dakota, Minnesota, and Montana. He doesn't see a growing demand for wooden wheels, but he does see a declining number of wheelwrights, which puts the odds in his favor. "I'm one of about 100 members of the Western Canadian Wheelwright Association," Svangstu said. "Not all members work on wheels. I don't foresee any large demand for wooden wheels or wheelwrights. Sometimes when people learn I'm a wheelwright they chuckle and ask if there's a big call for that kind of work," Svangstu added. "There's no huge demand for it, but there's always a certain number of people looking to have that kind of work done. It keeps me busy in winter and it's something I've grown to enjoy."